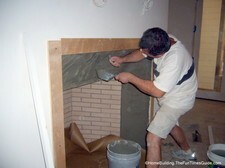 Bricks are commonly used in homebuilding and remodeling projects. They are both eco-friendly and aesthetically pleasing. If you'll be using bricks for the inside or outside of your home, look here first for some helpful tips from homeowners! 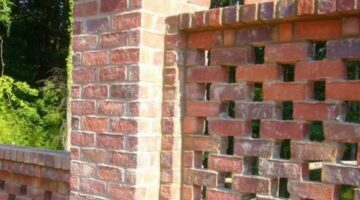 I recently heard someone talking about building a pierced brick fence as an alternative to a traditional yard screen. This was very intriguing to me so I did a little research on creating a cool brick wall look that also serves as a fence. This type of hardscaping is popular and can increase your home’s value if you plan to sell. Check out this gorgeous outdoor fireplace. It’s the focal point of a backyard playground complete with outdoor kitchen and gunite swimming pool. Do you have a few damaged bricks somewhere on your home or sidewalk/fence that need to be replaced? These step-by-step instructions tells you what you need to know to do it yourself. 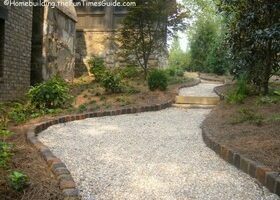 Here is an example of brick edging laid in a vertical fashion (sailor curb) with alternating colors of brick along pathways and a driveway. A beautiful finished product!